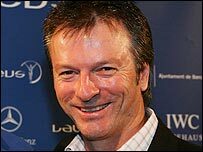 Former Australia cricket great Steve Waugh says the International Cricket Council has shown itself unable to eradicate match-fixing in the sport. And he called on players to take the lead to stamp out the problem. Waugh said: "I think it is disgusting, but what do you do to stop it? I don't think the ICC knows how to stop it or it would have been stopped before. "Really it's about the players, they have to put their hands up and say I'm 100% or sign declarations." Cricket's showpiece event, the World Cup in the Caribbean, has been overshadowed by the death of Pakistan coach Bob Woolmer, who Jamaican police say was strangled. Speculation has been rife that his death more than two weeks ago could be linked to the shadowy world of match-fixing, with few other plausible theories emerging. Waugh is in little doubt that match-fixing is still going on seven years after the former South Africa captain Hansie Cronje admitted taking money to lose a match. Waugh said: "Something has to be done because it is damaging the sport. Something serious has to happen now or the game will be damaged for ever."